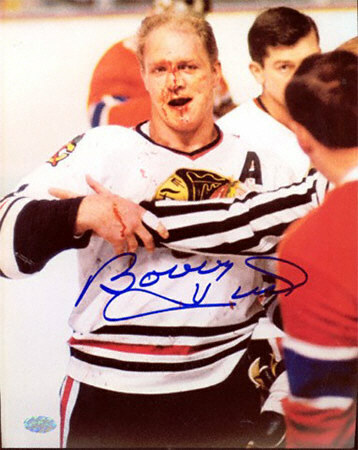 Bobby Hull hockey cards and autographed memorabilia are still highly collectible, long after "The Golden Jet" retired from the NHL. His speed and toughness on the ice defined the Chicago Blackhawks for over a decade. His ability to score at will, while, at the same time, punishing opposing defenders, endeared him to generations of hockey fans. Helping lead the Blackhawks to the 1961 Stanley Cup, the team's first in 23 years, cemented his place in hockey history. 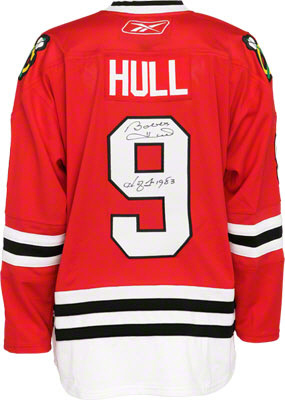 Now an ambassador of the game for the Chicago Blackhawks, Hull is frequently seen with the team and their fans, willingly signing autographs for whoever wants one. A frequent member of the large sports collectible shows that frequent the Chicago area, his autograph remains in high demand and has contributed to their stable values on the secondary market. On the rare occasion that Bobby Hull's game-used memorabilia comes to auction, whether it be sticks, skates or jerseys, all command tens of thousands of dollars. Inducted into the Hockey Hall of Fame in 1983, his most coveted items for collectors are signed sticks, game-used vintage autographed pucks and his rookie card. Bobby Hull's rookie card can be found in the classic 1958-59 Topps Hockey set. High-grade examples consistently sell in the four-figure range due to the fact that they are often very difficult to find in such condition. 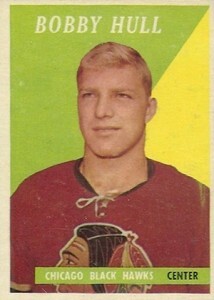 The 1958-59 Topps Bobby Hull rookie card is the foundation of the 66-card set. The fact that it's the last card in the series makes it especially difficult to locate in top condition. The card is prone to edge chipping and center creasing running horizontally as the result of being stored with rubber bands. The card is also notorious for displaying centering issues. The brightly colored background of yellow and green creates a striking contrast to the player image. Topps 1966 Bobby Hull #125 - Ex. 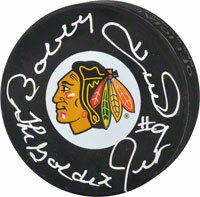 Below you will find an example of what Bobby Hull's authentic signature looks like. This can be used as a first point of reference for determining the legitimacy of autograph memorabilia, but is not a substitute for having your items authenticated by a well-respected professional autograph authentication company. Some of the trusted sources within the sports memorabilia market include the following companies: PSA, JSA, and Mounted Memories. The signature is written on an even horizontal plane or slight angle of about 20 degrees. Written in cursive, each letter is fairly legible. The letters :B" and "H" are over-sized. The "B" looks like a number "3" with a line curving off of the top to create the back line which does not connect with the rest of the letter. The "o" is legible and the "b"'s resemble the letter "U." The "y" is small but legible. The "H" is very unique in that the pen does not lift for the crossing, instead a line that creates a horizontal tear-drop shape is used. The "u" is legible and an awkward, single "L' finishes the signature. Hull is very accommodating with inscriptions which often include notations such as "9", "HOF", "The Golden Jet", "50 Goals", "500 Goals." To Nancy Best Wishes Bobby Hull signed card from around 1968. He was at a car dealership in Hamilton where my uncle took us to meet him. Is this worth anything.